Soft Show by Chanel Thomas features large-scale, hand embroidered, mixed media paintings and sculptures reflecting areas of cultural upbringing. 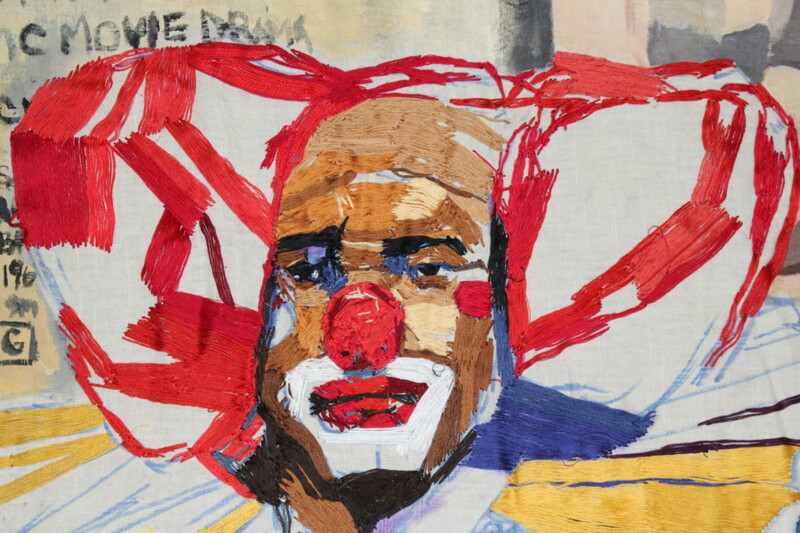 The exhibition is composed of primarily soft fiber works that portray elements of Thomas’ interior life, family, utilitarian objects, and elements of popular culture that colored the artist’s life during the 1990s and early 2000s. Soft Show speaks on feelings of nostalgia for a period in the artist’s life where dream and vulnerability exceeded social norms. The exhibition honors cultural upbringing and values, derived out of a longing to reconnect and reestablish family ties, as well as acknowledge the origins of identity. Chanel Thomas was born in 1991 in Chicago, IL. Thomas is an interdisciplinary artist working often in hand embroidery mixed media painting and ceramic sculpture. She completed a Bachelor of Fine Arts and Art Education from The School of The Art Institute of Chicago in 2014. Thomas began her career as an educator teaching in Chicago Public Schools from 2014-2017. She is a current resident at the Skowhegan School of Painting & Sculpture in Maine, and will be attending Yale University in the fall pursuing a degree of Master Fine Art in Painting. Since 2010, Thomas has been a part of group exhibitions around Chicago, including projects at Gene Siskel Film Center, Museum of Science and Industry, Roots & Culture, South Side Community Art Center, and Woman Made Gallery. Soft Show at Roman Susan is her first solo exhibition. This exhibition has been organized in partnership with ACRE – Artists’ Cooperative Residency and Exhibitions in Chicago, Illinois and Steuben, Wisconsin. Thomas will have a following solo exhibition at Goldfinch Gallery in late 2018. For more information, please visit chanelcthomas.com.